Metro Institute offers a full range of services from computers based test administration to on line registration and scheduling. Metro can provide custom programming and RFP consultation services to help your agency find the most effective and cost efficient options to help manage the licensing and certification process. Metro Institute has the capacity to offer multiple, simultaneous online tests. Our technical infrastructure includes programmers, interface developers, and a usability testing group. The system is available for testing participants and for administrative web-based reporting on a 24/7 basis. The testing system and related databases are routinely backed-up to prevent any potential loss of data. The Metro Institute Online Testing System is a robust, feature-rich Web-based software application for administering, scoring, and reporting tests. Based on the Microsoft .NET framework and Microsoft SQL Server, it is a proven technology that has delivered over 1,000,000 examinations to date for licensure and certification. The Metro Institute Online Testing System is a complete package that manages all aspects of the testing process: test and user administration, appointment scheduling, proctoring, examination, and reporting. All operations are managed by the Metro Institute team and delivered via secure, dedicated application and database servers. Once the Online Testing System has been configured with the collection of agency-provided tests—which typically includes test names, categories within each test, questions & answers, pass/fail score, and time limit, the tests are ready to be delivered online. As an agency identifies individuals allowed to take the online test(s), it enters information about the test taker into a Web-based form. This information includes the person's name, an identification number, and the category(ies) of tests approved for taking. Once this information has been submitted, the test taker contacts Metro Institute to schedule an exam at an approved testing location. At approved test taking locations, trained test proctors welcome test takers, verify their identification, take a picture of the test taker and upload it to the testing system, and log the test taker into a secured testing session on an approved computer. Testing sessions are monitored by the proctor to ensure the integrity of all testing events. Upon completing the test, the test taker sees their results on the screen and receives a printed copy of the results. These results are also then immediately available to the agency via Web-based reports and associated data files that the agency can download. The Web-based reports available to an agency can be sorted in a variety of ways for analyzing test taking activities. The agency, for example, can view test taking activities over a selected range of dates, within selected categories of tests, or they can view success/failure rates for individual questions or entire categories. Metro Institute can consult with your agency to initiate or improve Internet computer-based testing. There is no fee for this service. Let us help with your next RFP. Let Metro Institute design an on-line exam for your agency our company today. Metro provides provide a dynamic interface to deliver exams to the examinees at home or work. This is a complete system to allow testing for individuals that do not need on site proctoring. This is a complete system to allow testing for individuals that do not need on site proctoring. Convenient - Your employees or regulatory individuals can take any certification or training competency exams at their convenience 7 days a week 24 hours a day from home or work. Your testing center is always open. Dynamic - Exams can be delivered in conjunction with a multimedia training presentation. Your examinees will be both tested and educated. Affordable - Our system in some cases can be implemented with no upfront costs. Where this is not possible you will still find our offering very competitive. 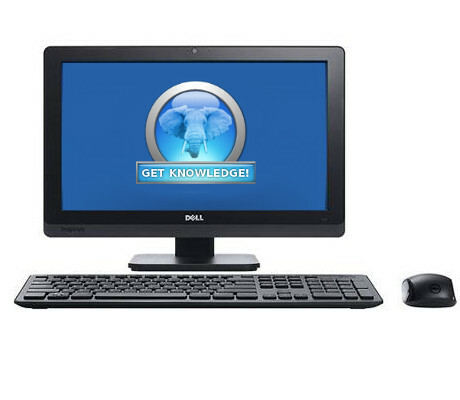 Secure - Your exams and training materials are stored on our ultra secure servers. Technical and physical server security is our number one priority. 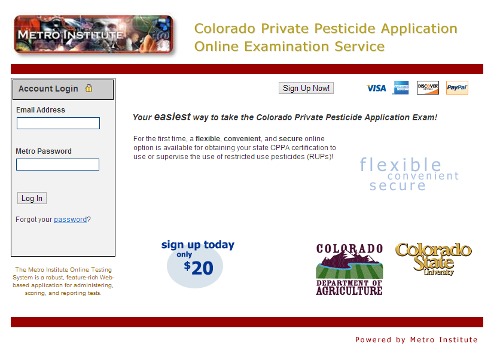 The Colorado Department of Agriculture has selected Metro Institute to provide the Priviate Pesticide Applicator Examination via the internet using our proprietary training exam delivery system. Let Metro Institute design an on line exam for your agency or company.